At least three Palestinians, including a child, were killed on Friday by Israeli army gunfire near the Gaza-Israel buffer zone. In a statement, Gaza's Health Ministry said a 14-year-old boy -- whose name was not given -- had been killed instantly after being shot in the head by Israeli troops east of the town of Jabalia. Meanwhile, east of Khan Yunis, a young Palestinian man -- also not yet identified -- sustained a fatal gunshot injury, according to the ministry. Eight other Palestinians, including three children, were reportedly injured by Israeli army gunfire elsewhere along the buffer zone. Mohammad Shaqqura, 21, was also martyred after being hit by a bullet in the chest in the central Gaza Strip's Maghazi refugee camp located in the Deir al-Balah Governorate, according to the Palestinian Health Ministry. On Friday, Palestinians converged on the border area to take part in ongoing demonstrations against Israel's decadeslong occupation. 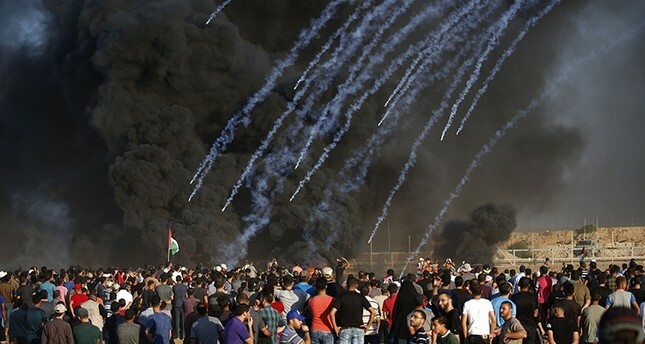 Since the rallies began on March 30, more than 160 Palestinians have been killed -- and thousands more injured -- by Israeli troops. Protesters demand the "right of return" to their homes and villages in historical Palestine from which they were driven in 1948 to make way for the new state of Israel. They also demand an end to Israel's 11-year blockade of the Gaza Strip, which has gutted the coastal enclave's economy and deprived its more than 2 million inhabitants of many basic commodities. Meanwhile, in the occupied West Bank, three Palestinians were injured on Friday when Israeli army troops forcibly dispersed several anti-occupation demonstrations. According to an Anadolu Agency correspondent, confrontations erupted between protesters and Israeli troops in the towns of Ras Karkar and Bilin west of Ramallah, the town of Beit Omar near Hebron, and the town of Kafr Qaddum near Nablus. Israeli troops reportedly used rubber bullets and tear gas to disperse demonstrators. In Ras Karkar, eyewitnesses told Anadolu Agency that "dozens" of protesters and local residents had suffered the effects of excessive tear gas. In Kafr Qaddum, Palestinian photographer Nidal Ashtia was injured after being struck by a rubber bullet, according to protest organizers. And in Beit Omar, eyewitnesses said that at least two people had been hurt by rubber bullets during clashes with Israeli troops near the town's main entrance. Every Friday, Palestinians across the West Bank hold anti-occupation demonstrations which are usually dispersed -- with excessive force -- by the Israeli army.